You'd think the cow in the background would have given it away. It's an easy mistake to make though. 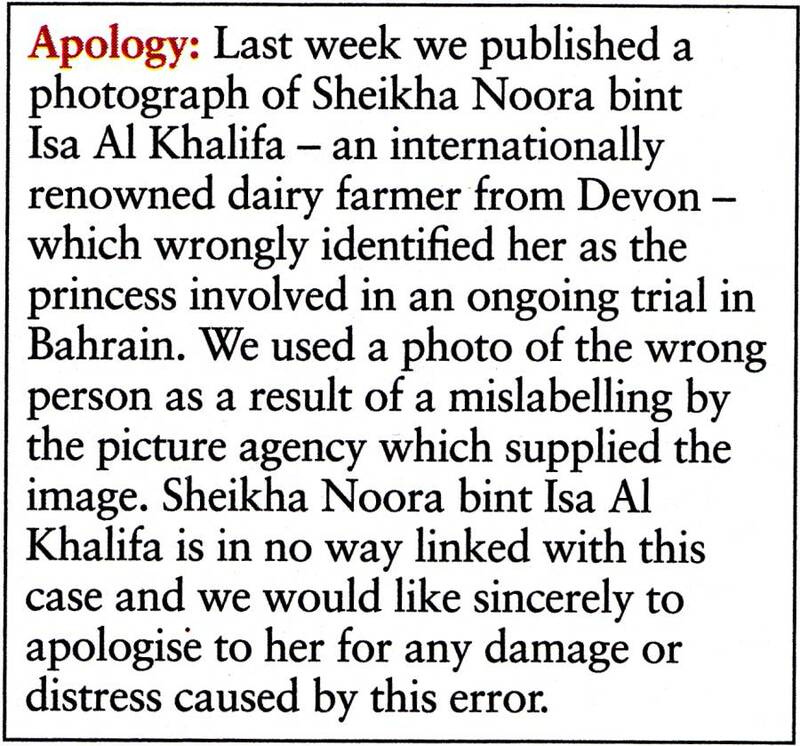 Personally I've never heard of this Noora bint, but I'm always confusing Devon dairy farmers with Bahrain princesses. It's why I've never married into royalty, but I eat a lot of cheese. 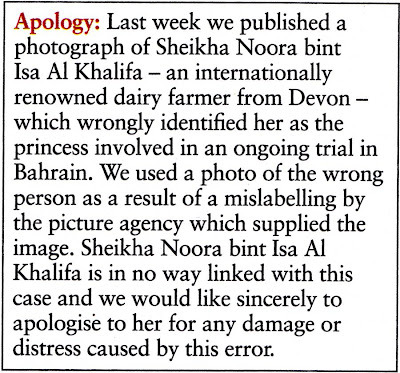 Admittedly there's a Persian Gulf of difference between a milk maid and a princess, but if I were Sheikha Noora bint Isa Al Khalifa, I'd change the 'b' in my name to a 'p' and tell everyone I come from Moo-rain. Bahrain sounds like it's full of royal shepherds. On the subject of awkward cows, I've spent today building bridges with Amelie (mostly out of Megablocks), and attempting to repair the father-daughter bond that was stretched to breaking point at the gates of Queens Park yesterday. Her first words to me this morning were "Have you still got a headache, Daddy? ", to which I was tempted to reply "Yes, and bizarrely we're trying for another one", but I wasn't sure she'd understand the subtext, so I told her I was fine, and offered to play a game with her instead. She owned that stage, made the song her own, and above all, proved that what the original lacked was a driving beat played on a plastic beehive. It's a yes from me. I have no idea what the original sounded like. The trick is to watch the video before you comment. The trick with your blog, Phil, is never to watch the videos. Where's Hellodadada? I think he missed his cue. Nice to see an outfit like the one I've bought my granddaughter being modelled. Just hope she likes it! This blog is as good as Google, isn't it 'old' friend? I did not even know what 'anabolic' mean! Labeling: Glance at the batch number and expiration dates.